Welcome home to luxury living for active lifestyles. Our modern pet-friendly apartments offer the kinds of features you’ve been looking for. 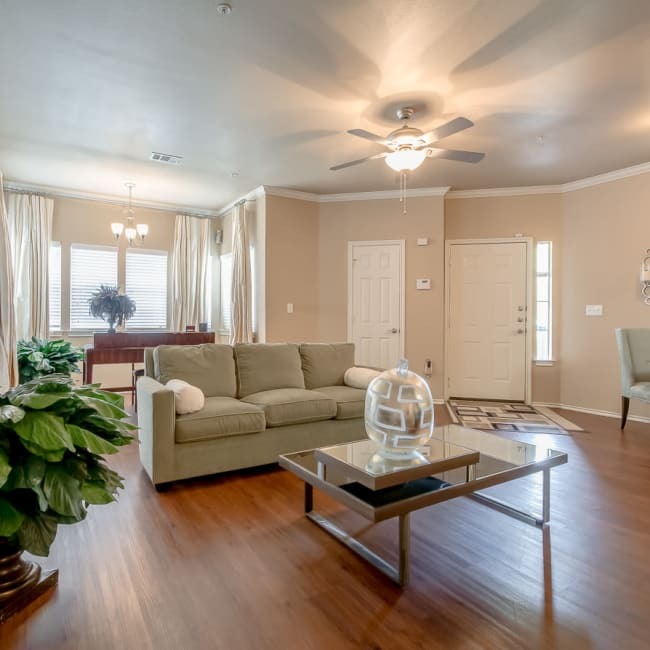 On the hottest of San Antonio, Texas, days, you’ll appreciate the simple pleasures of hardwood-style flooring and cold-blowing air conditioning. When the weather turns, cook a hot meal in your elegant chef’s kitchen, and then cozy up in front of the fireplace. Whatever the weather, it’s never a bad idea to toast another day well lived on your private patio or balcony. Welcome to the good life. You earned it. The good times don’t end when you set foot outside your door. Our vibrant community offers a luxury resort experience every single day. When there’s business to finish before the fun can begin, get to work in our modern business center or conference room. We even offer corporate suites for business people on the go. When the work is done, cool off with a refreshing dip in our elegant swimming pool, work out the kinks in our state-of-the-art fitness center, and then unwind among friends at our exclusive resident clubhouse. When you’re ready to sit back and relax, indulge in a new movie at our onsite theater. Ready to learn more about life at Alon at Castle Hills?